V. heyneana Roem. & Schult subsp. ficifolia (Bge. ) C. L. Li in Chin. J. Appl. Environ. Biol. 2 (3) : 250. 1996.——V. ficifolia Bge. in Mem. Div. Sav. Acad. Sci. St. Petersb. 2: 86. 1835; Planch. in DC. Monogr. Phan. 5: 364 & 612. 1887; 中国高等植物图鉴2: 770.图3270. 1972; W. T. Wang in Acta Phytotax. Sin. 17 (3): 86. 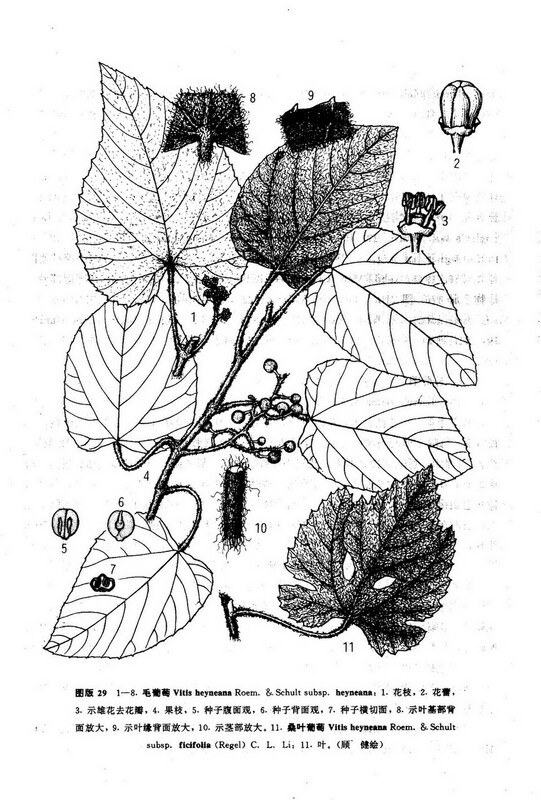 1979 in clavi; 秦岭植物志1 (3): 264.图227. 1981; 江苏植物志下册469.图1505. 1982. excl. syn; 北京植物志上册561.图709. 1984.——V. thunbergii Sieb. & Zucc. in Abh. Math.-Phys. Cl. Akad. Wiss. Munch. 4 (2) : 198. 1845; Planch. in DC. Monogr. Phan. 5: 333. 1887.——V. labrusca L. var. ficifolia Regel in Gartenfl. 22: 203. 1873. ——V. labrusca acut. non L. (1753) : Hemsl. in Journ. Linn. Soc. Bot. 23: 134. 1886 p. p.